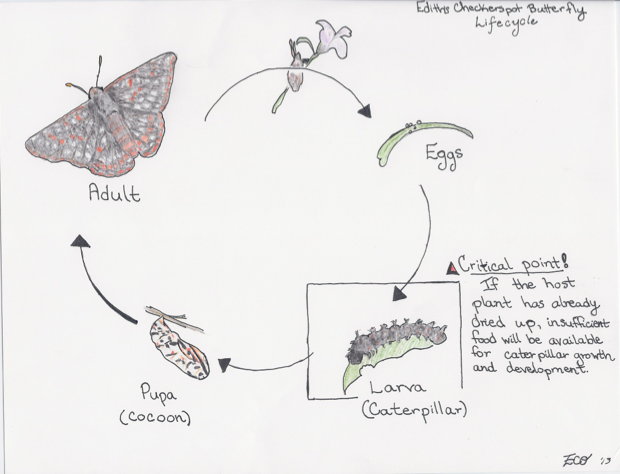 Life > Ecosystem Interactions > What does climate change mean if you're a butterfly? 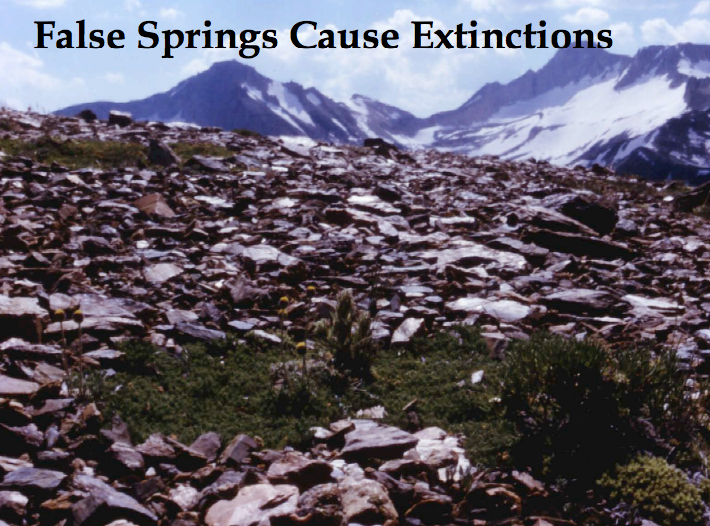 "What I was curious about was all these extinctions that were going on in...relatively undisturbed habitat." In this clip from a 2005 public lecture “Biodiversity and Climate Change,” biologist Camille Parmesan describes how curiosity about extinctions in relatively undisturbed areas led her to investigate the relationship between climate change and loss of populations of Edith’s Checkerspot Butterfly. She discovered that “false springs” and “timing mismatches” associated with higher than usual temperatures were leading to die-offs in butterfly populations. Populations at higher latitudes or elevations appeared to be less susceptible to extinction. The extinctions were population level extinctions, not the loss of the entire species. 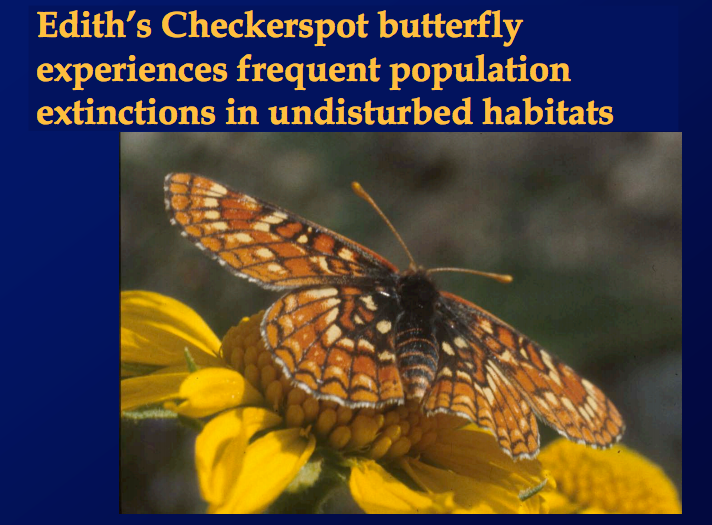 Dr. Parmesan looked at past records and performed fieldwork herself to determine where populations of Edith’s Checkerspot Butterfly had recently gone extinct. First, she gathered and examined data (where the butterflies were and were not, when plants known to be a food source dried up, and weather and temperature events). Then she used the facts (what had happened) to make inferences about why she thought the populations were disappearing. In science, the credibility of an inference can be tested by looking at the procedure followed by the scientist who made the inference. Peers will ask questions such as: Does the data make sense? Could the procedure be replicated to produce the same results? Dr. Parmesan provides a clear explanation of how and why she came to her conclusion that timing mismatches were causing die offs, so other scientists can easily critique her work. Scientific data suggest that the climate is warming. In both apparent and subtle ways, these changes in average temperature will impact where and if certain species are able to survive. Studies such as Dr. Parmesan’s can help people to understand what the direct factors in extinction are, allowing them to make better decisions about how to preserve valued species. What question led Dr. Parmesan to investigate butterfly populations in the study locations she chose? What is the relationship between warming and extinctions? What does pristine mean? Are there any truly pristine or undisturbed areas left? Consider both seen (garbage, cities, light) and unseen (particles in the air, nutrients, sound) human impacts on the Earth. Dr. Parmesan makes some detections (what is going on) and some inferences (why these things are happening). She concludes that climate change, through false springs and timing mismatches, has led to the extinction of certain butterfly populations. What are some factors that could confound Dr. Parmesan’s hypothesis (e.g. what are some other potential causes of butterfly extinctions in these areas?) How could you test this? Practice this math exercise in your science journal. In this clip, Dr. Parmesan describes how one population she observed was wiped out because of a repeated extreme event, in this case, a snowstorm. Imagine a population of 1000 butterflies. In “Year 1” a snowstorm kills 90% of the population. How many are left? In "Year 2" a second snowstorm occurs in early spring, killing off 90% of your new population (the population at the end of Year 1). How many butterflies are left now? In “Year 3,” (sorry, butterflies), another snowstorm occurs. 90% of the population (from year 2) is killed. How many butterflies are left? Is it possible for this population to survive? What about this scenario is natural? What, if anything, about this scenario is unnatural? Bonus! The previous activity was a simplified model: here is a more complex math problem. Imagine that half of a 100-butterfly population is female and half is male and that females and males are equally likely to die in a snowstorm. After one snowstorm, calculate the number of female butterflies left if 90% die off. If you end up with a number that involves a fraction, remember: half a butterfly is, logically, a dead butterfly. How many females do you have? Assuming all conditions above: if a snowstorm occurs every year, killing 90% of adults before the eggs are laid, how many years will it take for the population to die out? If no more spring snowstorms occur and only 20% of the adult butterfly population dies each year, how long will it take for the population to reach 100 again? This Parmesan clip came from a lecture she delivered to the public. Try watching a clip from a lecture where Dr. Parmesan is talking to other scientists. (See “Companion Clips” below.) How do they compare? In one circumstance that Dr. Parmesan describes, the caterpillars die because of a timing-mismatch: the plants they needed to eat during a crucial phase of their development have already dried up. All living things have certain types of life support that they must obtain from the environment. Humans have those needs too, but we have extended our local ecosystems (the area where we physically live) in order to meet those needs. 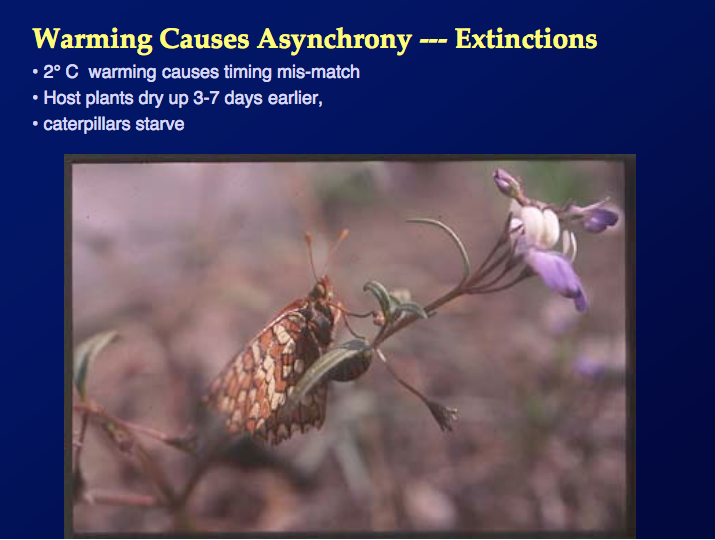 In this clip, the Edith’s Checkerspot caterpillars had difficulty meeting their survival needs within their current habitat. What are our habitat requirements as human beings? 1. Make a list of your survival needs. Consider: What is your water source? Does the amount of water you need occur where you live naturally? Where does your food come from? How does it get here? What are the temperatures like where you live? Do you use a heating or cooling system? 2. Many of the necessities keeping you alive may not come from your immediate habitat. In a sense, humans have found ways to extend their habitats using technology. What are your habitat extenders? Make a list of the technologies, infrastructures, or transportation means that bring your life support to where you live. 3. Where has your habitat been extended to? In other words, where do some of the items you rely upon to survive come from? This step may take some research. Try calling a power company, looking at clothing labels, checking signs at the supermarket, looking at maps of water sources, and using the Internet. How do these life support components come to where you are? 4. Look at your list of habitat extenders and prioritize it: which of these could you survive without? How long could you go without them? 5. Now that you have considered your life support and where it comes from, map your habitat. Print a map of the United States off the Internet or draw a rough map of the country. On this map, mark where you live. Draw a box around the borders of your town or city. For components that come from another country, draw a line to the edge of your map with an arrow pointing off the page. Looking at your map, how large is your habitat? What technological developments have made this type of extended habitat possible? Can you think of technologies (or tools) used by early humans that allowed them to live in places where survival of our species might not have otherwise been possible? 6. Have a discussion with a friend, colleague, or family member about what you discovered. Record this activity in your science journal, or share your thoughts with a friend. 1. Make a list of animals that live in your area that might be impacted by climate change. From the list, pick a favorite animal. 2. Imagine that you are a wildlife manager. You have been asked to ensure the survival of the animal you chose. The habitat you choose to protect for it must be a good place for this species to live for many generations. 3. Make a list. What are this animal’s requirements to survive as a population? Remember that in addition to daily survival needs, in order for the population to persist in this area, this animal must be able to successfully raise young. Are there any other species (plant or animal) on which your animal is dependent? What are a few of that other species’ requirements? 4. Look at the list of survival needs for your animal. How might climate change impact these needs? Is there one type of change (e.g. drought or increased heat) that would challenge their survival more than others? 5. Now you must make a decision as a wildlife manager. Where will you locate your wildlife preserve and why? Write or present a brief proposal of a habitat location for your animal. 6. Assess your plan. How likely is your species to survive changes to the climate of its habitat? Based on the information from Dr. Parmesan’s talk: what is a false spring? The complete video of this lecture and a full copy of the PowerPoint slides used can be found on AGCI's website. What does climate change mean if you're a butterfly? play Can a population evolve to survive? play What is a range shift and why do they happen? play How can climate change cause population extinctions?